This article is about the UNSC Sergeant. For the voice actor for Sergeant Stacker and Jacob Keyes, see Pete Stacker. "You heard the man, boys! It's time for some hazard pay!" — Gunnery Sergeant Stacker during the Battle of Mombasa. Master Sergeant Marcus P. Stacker (service number 41009-31545-MS) is a veteran UNSC Marine who fought during the Human-Covenant War and the subsequent conflicts. "Kilo 26, this is Kilo 40; Covenant corvette's raining hell on us. Final protective fire one, danger close, my command, over." A grizzled Sergeant Stacker during the Fall of Reach. Stacker served during the Fall of Reach in 2552, under the call sign "Kilo 40". He participated during the Siege of New Alexandria, communicating with Kilo 26 and Kilo Dispatch, and along with several other units, assisted in the evacuation of civilians from Traxus Tower. Stacker was in charge of managing the elevators and ordered Kilo 26 to fire on a Covenant corvette overhead. Stacker's part in the later portion of the battle is unknown, but was on board the UNSC Pillar of Autumn by August 30. Sergeant Stacker during the Battle of the Silent Cartographer. Stacker was one of the many Marines who crash-landed on Installation 04 following the boarding of the Pillar of Autumn and Captain Keyes' subsequent order for all personnel to evacuate the ship. His lifeboat made a hard landing in a valley near a beam emitter on the ring world. Most of his men survived the crash, but they were soon found by Covenant forces. Stacker and his team took shelter in the hills near the beam emitter and fought the Covenant from there, several of the Marines becoming wounded. Fortunately, Stacker and his men were rescued by John-117 and evacuated by Echo 419. Stacker was in command of a five-man fireteam, which was shot down in a snowy valley while on patrol. They soon came under attack from a Mgalekgolo pair, and lacking sufficient weaponry to bring the aliens down, were forced to retreat. Immediately afterwards, they were found by John-117, who had also found Fire Team Zulu during his push though the area to find the Installation's control room. Both Marine fire teams helped the SPARTAN to clear the area, allowing them to be extracted while the Chief continued towards the control room. Eventually Stacker managed to find a way to escape from Installation 04 before its destruction by the Master Chief. He was able to return to Earth by October 20th. Stacker and his squad take cover. — Stacker instructs Butkis to drain the shields of a Sangheili who held Lance Corporal Jones hostage with an energy sword. During the Battle of Earth, Gunnery Sergeant Stacker served in the 7th Battalion of the 105th Shock Division. He had shaven off his facial hair. He was dispatched from the UNSC In Amber Clad with a squad of ODSTs to relieve UNSC Marine infantrymen stationed in the city. His Pelican was shot down by a Scarab over Old Mombasa and crashed landed on an open beach near Hotel Zanzibar, killing the pilots and one marine. The surviving ODSTs were immediately engaged by a Covenant patrol led by a Special Operations Sangheili. During the brief assault, the Sangheili held one of his troopers hostage momentarily before Stacker shot the Sangheili in the head. Stacker and his Marines then holed up in the nearby Hotel Zanzibar to wait for John-117 to come and relieve them. They were soon attacked by another group of Covenant infantry, and were pinned down in the hotel's lobby by a plasma cannon by the time John-117 arrived. He then assisted the Chief and his AI compatriot Cortana in chasing the Scarab walker. He drove a Gauss Warthog, offering the SPARTAN-II the Gauss cannon. He assisted the SPARTAN-II by transporting him to the Marine command post, which was under the bombardment of several Wraiths. Clearing out the attacking Covenant, they reached the command post, where Stacker relieved Staff Sergeant Banks of his authority over the command post, while Banks assisted the SPARTAN-II in destroying the Scarab walker. Sergeant Stacker's efforts allowed UNSC forces to be supplemented, re-supplied, and eventually evacuated. Stacker was evacuated to In Amber Clad along with the rest of the 105th. Despite this, he was also present in New Mombasa after Regret's assault carrier had withdrawn from the city, fighting alongside the members of Edward Buck's ODST squad. Stacker was one of the shock troopers leading the attack on Installation 05. Stacker, John-117, and several other ODSTs managed to secure several Forerunner ruins, allowing for vehicular support to be brought in. Stacker and his men supported the SPARTAN-II as he pushed through heavy Covenant defences on the way to his target: the Prophet of Regret. Eventually they were able to push through to the Prophets temple, where they were pulled back to support Commander Keyes and Sergeant Major Johnson in an attempt to get the ring's Activation Index while the Chief proceeded to kill the Prophet. Unfortunately, Stacker's men suffered almost total casualties in the battle, with large numbers being killed and infected by the Flood. Others were killed by arriving Jiralhanae forces. Stacker, along with Johnson, Banks, and Miranda Keyes, were captured by Jiralhanae forces and sent to High Charity. Eventually, Stacker, along with Johnson and Banks were brought to a series of structures held by the Jiralhanae. The three were about to be executed when the Jiralhanae were attacked by Sangheili forces lead by the Arbiter. In the confusion, the UNSC soldiers managed to board the nearby Scarab walker. Stacker and Banks were presumably evacuated by the Arbiter and his allies after the neutralization of Installation 05. They eventually returned to Earth. "My convoy's been hit, I repeat, my convoy's been hit, I've got wounded... We're on Tsavo Highway, about... east of Voi. Someone, anyone, please respond!" Stacker returned to standard Marine Corps and grew out his beard again. Late in the Battle of Earth in Kenya, Stacker, along with Sergeant Major Johnson, led a Marine force that recovered John-117 after his atmospheric landing. Gunnery Sergeant Stacker took command of First Squad, which acted as scouts for Johnson. Stacker and First Squad followed John-117 and Thel 'Vadam through the jungle and linked up with Bravo team's only survivor, Gunnery Sergeant Reynolds. After rescuing Sergeant Johnson and the remains of Second Squad, Stacker was evacuated to Crow's Nest. After the Covenant assault of Crow's Nest, Stacker led a convoy presumably consisted of injured Marines or support forces. The convoy was intercepted by Covenant forces with Choppers, Shade turrets and large numbers of infantry pinning the survivors down in several small structures. Having received the transmission, John-117 arrived and assisted the besieged UNSC forces in eliminating the Covenant forces. Stacker later accompanied John-117 to Voi. Stacker and Gunnery Sergeant Reynolds managed to rally several squads of Marines, and made an assault on Traxus Factory Complex 09 in South Voi. There, they eliminated Covenant armored forces and anti-air batteries, paving the way for Lord Hood's Home Fleet to engage the Prophet of Truth above the Portal. Later, when a Flood-infested CCS-class battlecruiser crashed in the area, Stacker and his men were pinned down in a warehouse while masses of Flood combat forms and infection forms assaulted them. Stacker valiantly used a shotgun against the parasitic creatures until the Master Chief returned to help them. He was then evacuated to the Forward Unto Dawn along with his surviving Marines. "Hey, how does 90 millimeters of tungsten strike you?" During the Battle of Installation 00, Sergeant Major Johnson organized a makeshift UNSC armored unit from the UNSC Forward Unto Dawn for an assault on the Ark's Cartographer. Stacker commanded the platoon of Scorpions against a battalion-sized Covenant armored force outside of the complex and managed to eliminate a Scarab with John-117's help. 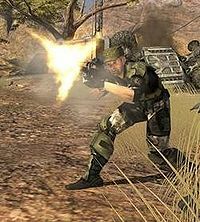 Later in the battle, he became part of an assault to destroy Covenant infantry and armored forces on the outskirts and beachhead of the Citadel, where the Prophet of Truth was located. Stacker escaped back to Earth aboard the Shadow of Intent along with Gunnery Sergeant Reynolds and the rest of the Forward Unto Dawn's surviving crew. He was last seen attending the memorial for the UNSC fallen and was in charge of a three-volley salute. "I'm reading Sierra One One Seven on-sensor. Everyone form up on the Chief!" — Stacker during the assault on Requiem's gravity well. After the war against the Covenant, Stacker was promoted to Master Sergeant and assigned to the UNSC Infinity. When the ship was caught by the gravity well of the shield world Requiem in July 2557, Stacker survived the ship's impact. Later, during a mission on the surface of Requiem, he commanded a platoon of armored vehicles during the assault on several particle cannons and the gravity well generator. The Master Chief soon arrived and helped the Marines complete their objective. Identified by his strong southern American accent, Stacker is a tough, strong, energetic Marine, and although he can be quite reckless in certain situations, he is a competent leader who has seen his fair share of war. Having survived many battles including all discovered Halo installations, Stacker has fought alongside John-117 on many occasions, often providing assistance in vital situations. Whether it be offering the SPARTAN-II a vehicle, weapon, or compliment, Stacker harbors great respect for the SPARTAN. Having survived the Battle of Installation 00, and the end of the Human-Covenant War, he is one of the few surviving members of the UNSC that can say they fought beside the Master Chief. Similar to fellow Marine Chips Dubbo, Stacker's canonical status remains in limbo despite his frequent appearances in gameplay. Though Stacker can be killed during gameplay, he will later reappear without any explanation. The circumstances of his survival from Alpha Halo and return to Earth are also shrouded in mystery, since neither he or Dubbo was aboard Polaski's Pelican or John-117's Longsword which were the only known crafts to escape Halo. In Halo: The Flood, Stacker is substituted by Sergeant Waller and Sergeant Parker in his Halo: Combat Evolved appearances. "Stacker" NPCs are used to represent both regular Marines and Orbital Drop Shock Troopers in Halo 2 and Halo 3. Strangely, he is depicted as a regular Marine during the Halo 2 level Outskirts, yet he and his fireteam wear ODST armor in the deuterocanonical cutscene Another Day at the Beach, which is concurrent with the beginning of the level. In Halo 3: ODST, Pete Stacker (his voice actor) even portrays an NMPD officer with the exact same mannerisms and bearing as Gunnery Sergeant Stacker, though he is obviously not meant to be the gunnery sergeant. Despite Stacker's frequent appearances in the original trilogy, he is not addressed as such in gameplay prior to Halo 4: Halo 2's credits erroneously list him as "Sergeant Stacker", while Halo: Reach's armory correctly identifies him as "GYSGT Stacker". VA Pete Stacker is not credited for the role in Halo: Combat Evolved, though he is listed as a generic sergeant in Halo 3's credits. His first name and middle initial were finally revealed in the Halo 4 level Reclaimer. It is likely that there is a canonical incarnation of his character, even if some of his appearances are meant to represent other Marines in a fictional sense, such as Waller and Parker in the case of Halo: Combat Evolved. Check out our collection of quotes related to Marcus Stacker in its quotes page. He is named after the person who voices him, and who also voiced Jacob Keyes in Halo: Combat Evolved and Halo: Reach. Stacker has also voiced a number of other characters, including an NMPD officer in Halo 3: ODST and one of the Sabre pilots in the level Long Night of Solace in Halo: Reach. In Halo: Combat Evolved, Stacker's in-game texture bitmap, "Marcus", is modeled after the game's Art Director Marcus Lehto. He retains a similar appearance throughout the first three games. His first name, revealed in Halo 4, appears to be a reference to Lehto, whereas his second initial, "P." is most likely referring to his voice actor, Pete Stacker. In Halo: Combat Evolved and Halo 3, he has a scar under one of his eyes; he does not have it in Halo: Reach. It is possible that he received it during the Fall of Reach. On the level Cairo Station, Stacker is seen wearing his service uniform with a major emblem instead of a Gunnery Sergeant emblem, like any other Marine (e.g. Avery J. Johnson and Banks) wearing his/her service uniform. Occasionally in Halo 2, mainly on the level Regret, a glitch occurs in which Stacker will appear, but will have Banks' voice and vice versa. Stacker's voice is usable in Halo: Reach's Firefight mode. Stacker has the least expensive Firefight voice, costing only 5,000 credits. In the campaign level New Alexandria, if played on co-op, an army trooper with Stacker's voice will appear as the gunner on the second Falcon. A profile of Stacker in Halo: Combat Evolved. A full-body portrait of Sergeant Stacker in Halo 3. A portrait of Stacker in Halo 3. Stacker and First Squad in the Kenyan jungle in Halo 3. Stacker, part of the three-volley salute. ↑ Halo 4, campaign level Reclaimer - "The Gravity of the Situation"
↑ Halo: Reach, campaign level Exodus - "The Devil His Due"
↑ Halo: Combat Evolved, campaign level Halo - "Reunion Tour"
↑ Halo: Combat Evolved, campaign level Assault on the Control Room - "I Would Have Been Your Daddy..."
↑ Halo 2, campaign level Outskirts - "A Day at the Beach"
↑ Halo 2, campaign level Metropolis - "This Town Ain't Big Enough For Both Of Us"
↑ Halo 3, campaign level Sierra 117 - "Walk It Off"
↑ Halo 3, campaign level Tsavo Highway - "Full Contact Safari"
↑ Halo 3, campaign level The Ark - "Forward Unto Dawn"